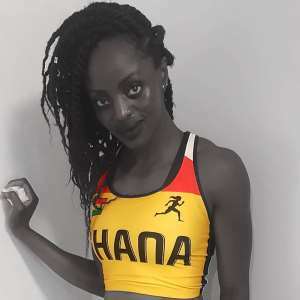 Ghana’s top female sprinter Flings Joyner Owusu-Agyapong who has been nominated for the GUBA Awards in the USA has started preparations for upcoming international competitions. The hope of Ghana in the female sprint events said she is getting ready to intensify her training for the 2019 World Championships and the 2020 Olympic Games. Joyner Owusu-Agyapong who is eyeing her first personal major international medal said it has not been easy training and studying but it shall be well as she wants to the next flying queen of Africa. Owusu-Agyapong attended Syracuse University on an athletic scholarship. While at Syracuse she broke the school records for the 55, 60, and 100 metres and was a two-time 2nd team All-American. She graduated from Syracuse with a Bachelor of Science in Public Health. She competed in the 100 metres and the 4 x 100 metres relay at the 2016 Summer Olympics in Rio de Janeiro, Brazil. She was also the flag bearer for the Ghanaian team at the opening ceremony. Owusu-Agyapong competed in the 60 metres at the 2014 and 2016 World Indoor Championships without advancing from the first round. She competed in the 100 metres and the 4 x 100 metres relay at the 2016 Summer Olympics. She achieved qualification for the 100 metres in April 2016 by running 11.30 at the 2016 Miami Hurricane Alumni Invitational in Miami, Florida. With her teammates Gemma Acheampong, Janet Amponsah, and Beatrice Gyaman she achieved qualification for the 4 x 100 metres relay on 8 July 2016 by running 42.67 to win the 4 x 100 metres at the Soga-Nana Memorial meet in Cape Coast. The time of 42.67 was a new national record, eclipsing the previous record of 43.19 that had stood since 2000. The same team also won silver at the 2016 African Championships in Durban in June 2016 in a time of 44.05. She finished 4th in her heat of the 100 metres in a time of 11.43 at the 2016 Olympic Games but did not advance to the semifinals. In the 4 × 100 metres, the team finished 8th in their heat in a time of 43.47 and did not qualify for the final. She is hoping and praying for the tide to be in her favour to write her name in the record books.